This photograph from the papers of the late Jennie Hobbs of Pilton, who died in January 2018, shows a class of girls from the Central Girls’ School, Barnstaple, in 1937. No specific references to this school have been found online, so further research is needed. It was located on North Walk, on the river side of the Barnstaple Cattle Market close to Barnstaple Town Station, which appears in the background. 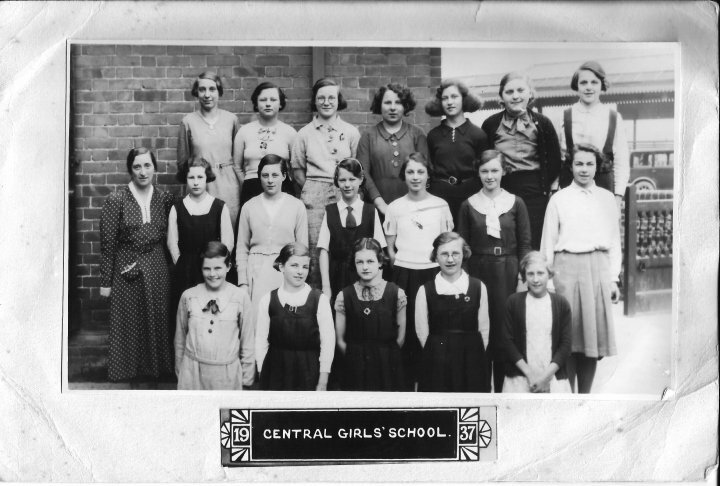 Jennie Hobbs, who is standing on the back row on the right-hand end, was 14 in 1937. Sadly, it is unlikely that any of these girls is still alive, but if anyone can shed any light on the school and any of those in the photograph we would be very pleased. At one time it is understood to have also housed Barnstaple Parish Church Junior School. We thank Mary Passmore, Jennie’s cousin, who also briefly attended the school, for passing us this and other items from Jennie’s papers.